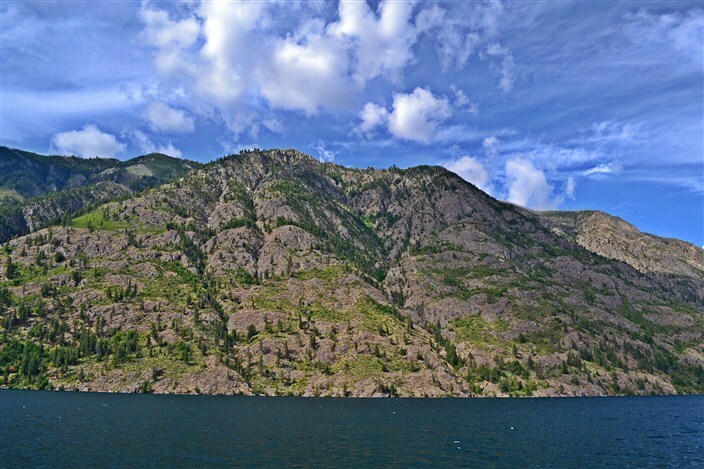 Situated in the heart of the North Cascade mountain range in Washington state lies Lake Chelan, the third deepest freshwater lake in North America, bottoming out at a depth of 1,486 feet (453 neters). Only Crater Lake in Oregon, at a depth of 1,949 feet (594 meters), and Lake Tahoe, 1,645 feet (501 meters) are deeper. 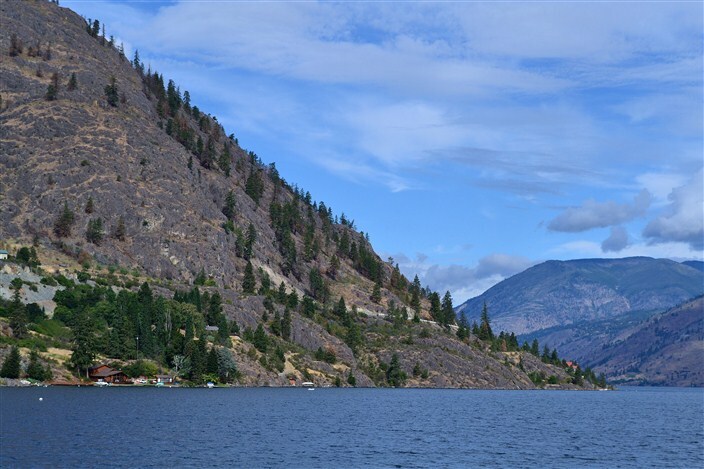 This is all the more remarkable when you consider that at its widest point, Lake Chelan is only about two miles across, while at its narrowest spot, near Wapato Point, it is a mere quarter mile wide. 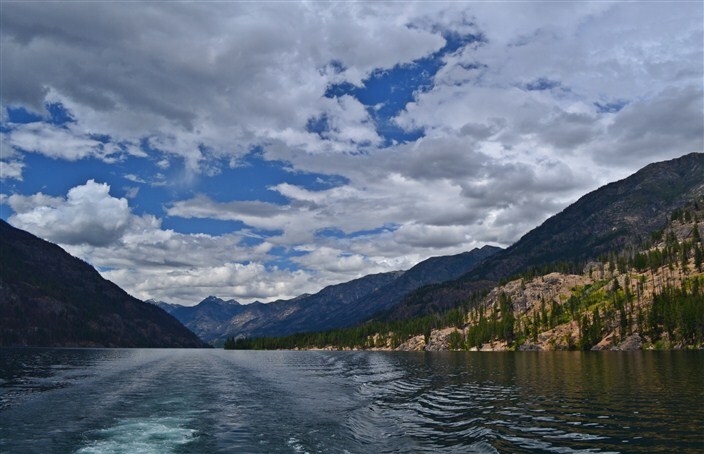 Taking into account its length of 50.5 miles, however, you begin to understand even without benefit of a map the slender, sinuous nature of Lake Chelan. Classified as a fjord type of lake, it requires only one viewing to see why. Towering, forested cliffs plunge dramatically into the crystal clear blue waters of the lake for much of its length, more so the farther north you travel. 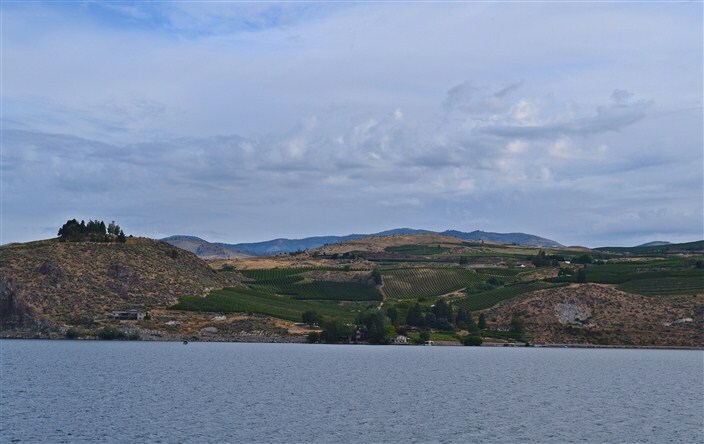 Only at the southern end of the lake, near the town of Chelan, is the surrounding topography given to more gentle, rolling hills. 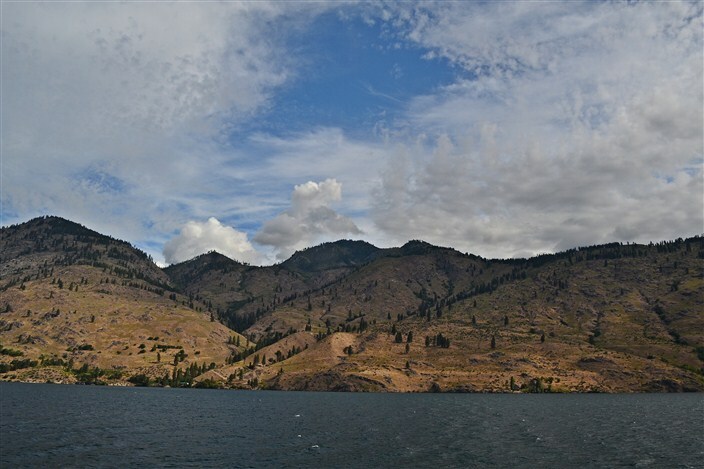 Lake Chelan is home to two state parks and is easily one of the most popular summertime destinations among Washington state residents. It’s a two-and-a-half to three hour drive from the Seattle metropolitan area, and with the region’s sunny, dry, warm to hot climate, it beckons hordes of westsiders to make the drive over all summer long. Recently, we decided to join them for a few days. There are times when the summer weather in the area can be brutally hot – into the triple digits – but on our trip we were fortunate to see the thermometer top out only in the low eighties. 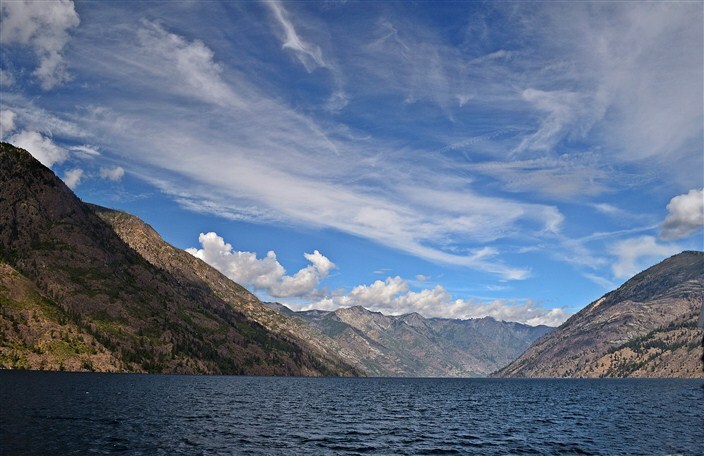 Due to its tremendous depth, the water temperature of Lake Chelan stays cold year round, making it quite a shock to the system when you take that first dive from blazing hot sunshine into frigid lake water. That’ll wake you up real good. 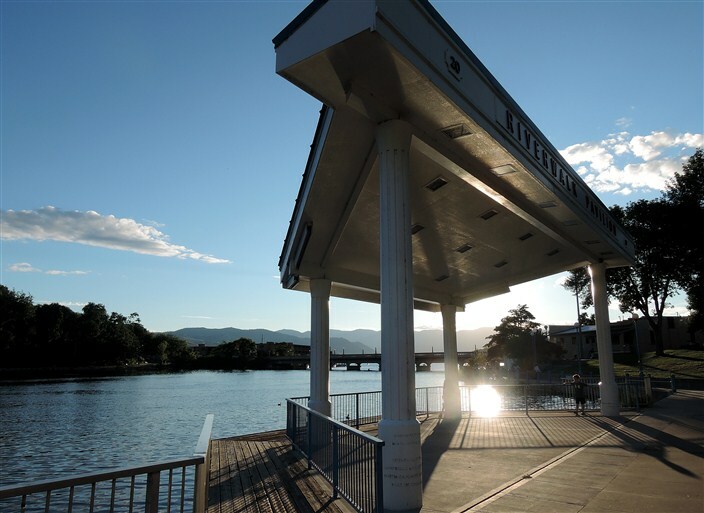 If it’s water activities you’re after, you can find anything and everything you could possibly want in the town of Chelan. Boats of all shapes and sizes, kayaks, canoes, sailboats, jet skis, water skiing, parasailing, snorkeling, scuba diving, and, oh, yeah, there’s always plain old swimming. When you get tired of the water, there’s some great mountain biking trails in the area. Or if you’re looking for something less strenuous, check out the burgeoning winery scene. More and more vineyards dot the hillsides around the vicinity every year. And if you’re tired of swimming in the lake, there’s a large waterslide park in town that’s always a big hit with families. 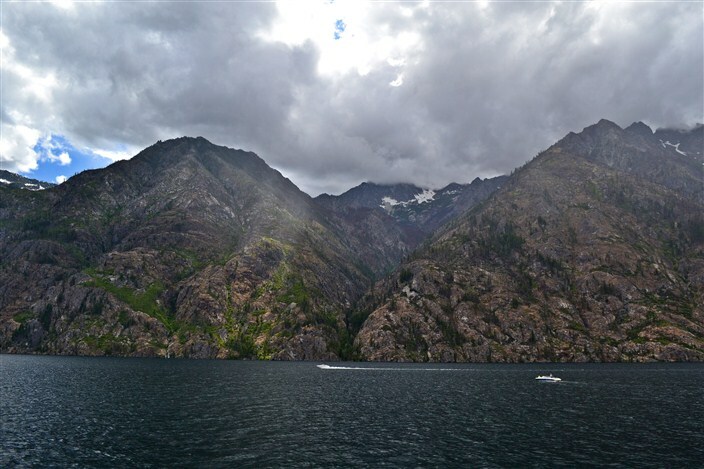 The highlight of our own trip was a voyage uplake, from Chelan at the lake’s southern tip, to the village of Stehekin at the far nothern end of the lake. 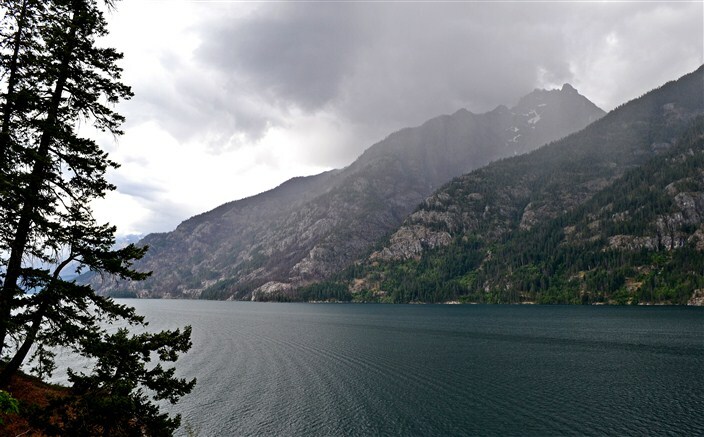 Stehekin is about as remote as you can get in the lower 48 states. 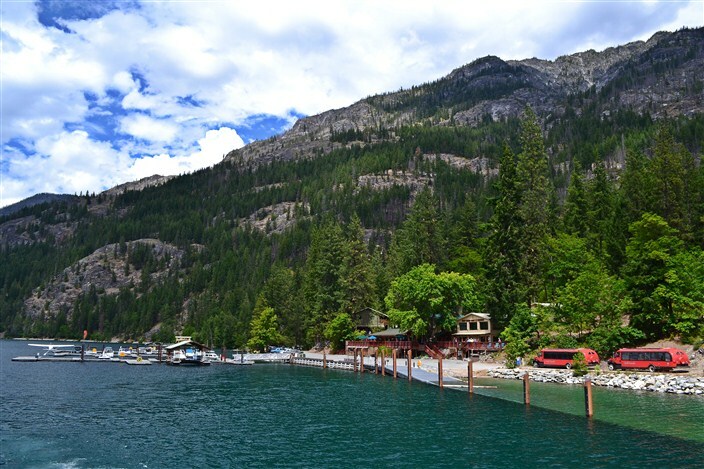 Boasting a whopping 75 or so permanent residents, Stehekin is reachable only via boat or float plane. There are no roads in or out. We chose to make the trip on the Lady of the Lake, a daily excursion service featuring two different boats. 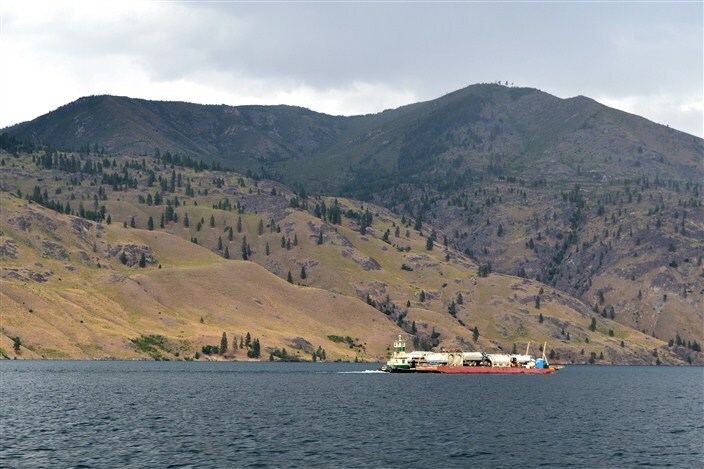 The Lady II takes four hours to cruise the length of the lake, while the Lady Express reaches Stehekin two and a half hours after leaving the dock in Chelan. The farther north you get, the more you understand why there are no surface roads up here. The land surrounding the lake is some of the most rugged terrain imaginable. The only flat surface in sight is the lake itself. 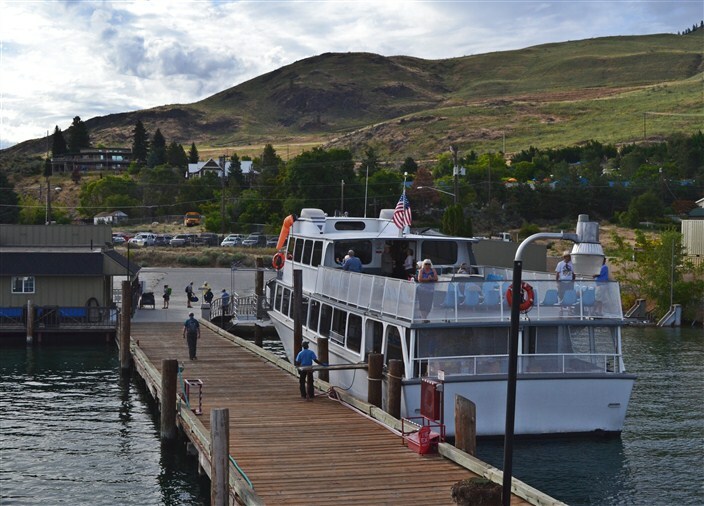 The boats leave Chelan at 8:30 a.m. and chug along steadily up the lake. Both of them are two-level vessels, with some seats in an enclosed cabin area and some outside. On the day we traveled, our boat was only about half full of passengers, which afforded us the opportunity to move around freely during the ride and experience the views from just about every angle on both levels of the ship. We appreciated the pilot’s occasional narration illuminating various facts and points of interest during the ride. We’ve been on tours before where the guide/driver overdid it and yakked nonstop until after a while you wanted to strangle the guy. We thought this gentleman got the balance just right, with enough key information and storytelling to enlighten and entertain us, but not so much as to be annoying. 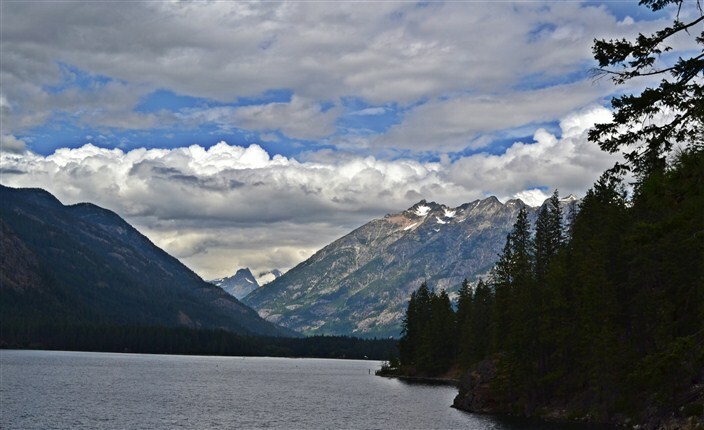 Once you arrive in Stehekin, there are a number of things to do. 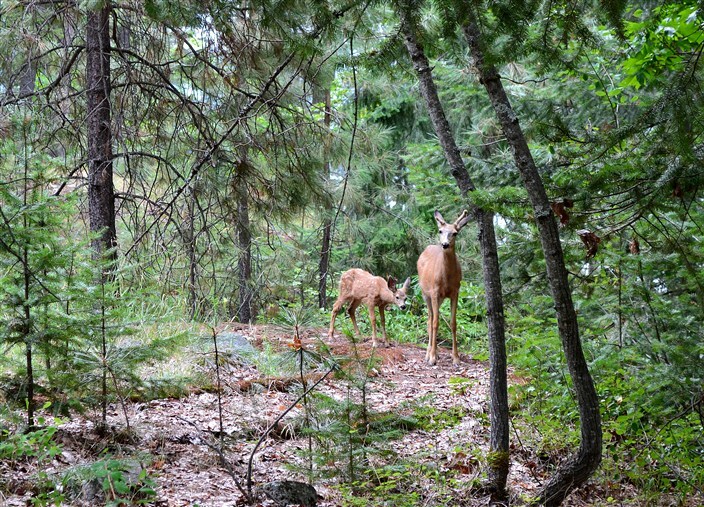 Some folks come to stay either overnight or for more extended visits. 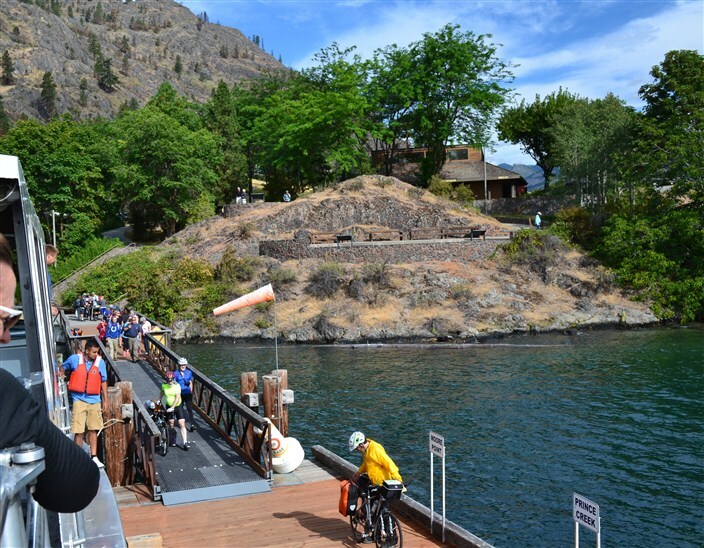 There is a lodge right beside the dock as well as several other cabin and camping options a bit further up the valley. Many use Stehekin as a jumping off point for backpacking trips into the wilderness of North Cascades National Park. Many others, like ourselves, just come for the ride, to see the lake and to spend a little time before returning to Chelan. One of the best things about the Lady of the Lake is having the flexibility to choose your return time. 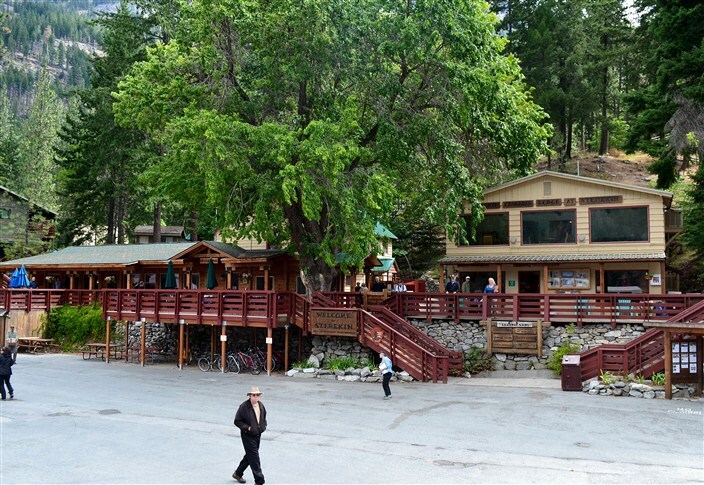 If you arrive on the Lady Express, as we did, it returns after only a one hour stay in Stehekin. 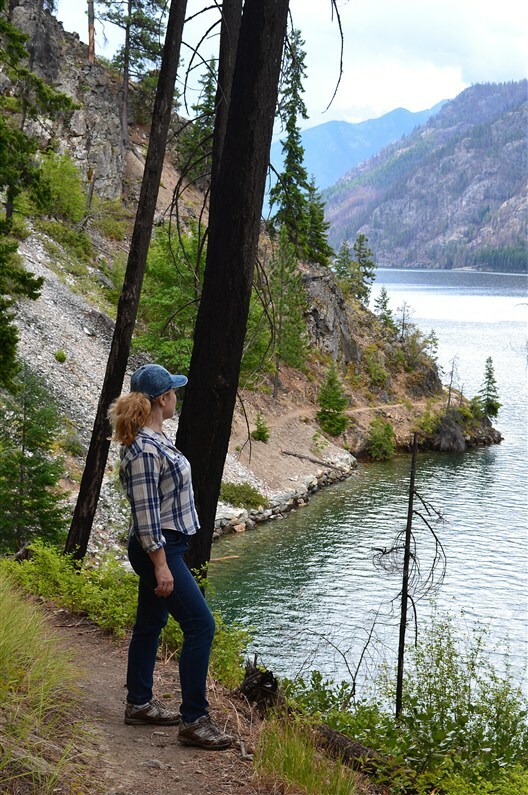 We thought this too short a time to explore the village, and so we opted to return on the Lady II, which gives you three hours in Stehekin. This seemed just about right. We had time to explore the area a bit, stop in and visit the ranger station, and take an hour hike along the lakeshore trail, which extends 17 miles downlake on the north shore. The day had started sunny and warm in Chelan, but the farther north we’d come the more clouds had rolled in. By the time we started our lakeshore hike we could see rain showers drifting toward us from the other side of the lake. Sure enough, about half a mile into our walk, raindrops began to fall. Now, being sturdy northwest hikers, we’re accustomed to the occasional sprinkle (or worse) when hiking. But we were not equipped for it this time. I mean, gimme a break, we came all the way to Eastern Washington to find sunshine and heat and now it’s going to rain on us? We hesitated, found a tree to shelter under and waited. After five minutes or so the shower abated and we resumed our trek. Five minutes later it started raining again. We waited, then started back towards town. Then it stopped raining again. We turned around and walked another ten minutes or so and then realized that with all our starting and stopping it was now time to return in order to not miss our boat. Do that and you’re staying the night. The showers soon cleared out, we boarded our boat, and the return trip was pleasant enough, if a bit long. It’s a trip well worth taking and one I would recommend to anyone who enjoys an extended, up-close look at spectacular mountain scenery while cruising along one of the most beautiful lakes in the entire country. 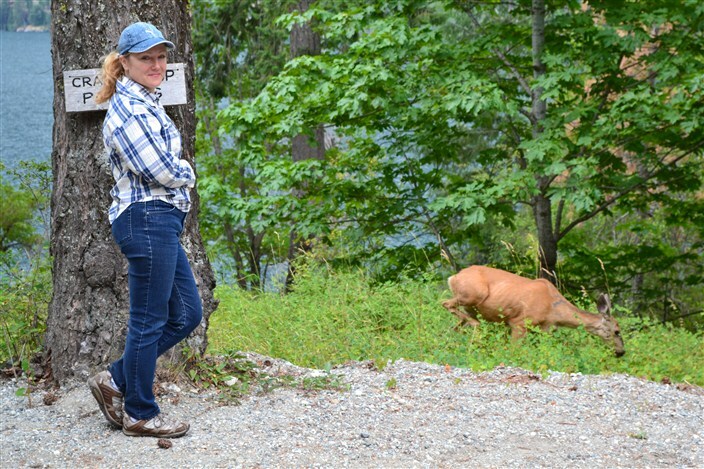 We’re already planning a return visit, both to the lake and to Stehekin, and I think you would, too.